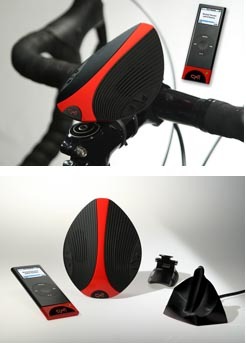 cy·fi, the world's first wireless bicycle speaker and ultimate iPod accessory, offering cycling professionals and enthusiasts a unique listening experience, will be unveiled next week at Interbike 2007 (www.interbike.com) in Las Vegas. Slightly larger than a deck of cards and weighing less than three ounces  cy·fi's incredibly compact design is the first revolutionary product of its kind to be introduced to the cycling world. Portable, and easily mounted on any bicycle mainframe, cy·fi enables users to enjoy all of their digital music, offering unprecedented sound quality and battery life, while eliminating the safety concerns associated with headphones or earbuds when riding. cy·fi is the brainchild of Jeff Lotman, CEO of Global Icons, a premier brand licensing agency, and an avid cyclist who recognized the need to provide a solution to the dangers of biking with headphones. "I wasn't aware of any other bikers or cars, or my environment," says Lotman. At the same time he knew he couldn't stomach giving up his music. "It's what motivates you and makes you want to exercise." "As a product-first, it made sense," says Arnold Kamler, Chairman of the Board for Kent International, and Lotman's partner on the project. "The safety aspect was what really caught my attention at first, then adding the original and progressive nature of the product design process made it a very attractive proposition." Impact Design Associates was tasked with developing the initial design. Product designer Max Beach contacted Rocky Gonzalez of 3D Mass to translate the cy·fi idea from concept to a fully functional prototype. Beach and Lotman agreed that the goal was to make it as lightweight as possible, and capable of delivering high performance sound quality. That challenge was solved by using a pioneering wireless audio technology offered by Kleer that combines full CD quality sound with ultra low power consumption, to deliver 100% lossless performance. By using this low frequency technology, 3D Mass was able to create a customized amplification system encased in a compact speaker design with extended battery life. Delivering cutting edge technology with visual impact, cy·fi became "HI-FI". "We're thrilled that Global Icons has recognized Kleer as the ideal technology for this exciting new application," says Ron Glibbery, VP of Marketing for Kleer. "In fact, this application is not viable with other technologies such as Bluetooth, as the speaker battery life would be shorter than most bicycle rides." cy·fi is the world's first wireless bike speaker. Compatible with iPod and the iPod nano, cy·fi offers 100% lossless, CD-quality audio, up to 6 hours of battery life, remote control of track, volume and playlist settings, lightweight portability and multipoint broadcasting to up to four cy·fi speakers. cy·fi will be available in specialty retail and better bike stores starting in 2008. Visit booth 4809 at Interbike 2007 for a cy·fi demo. Kleer is the first wireless audio technology to combine full CD-quality audio with ultra-low power consumption. Thanks to its patented sub-sampling radio architecture, Kleer is able to deliver 100% lossless performance at a fraction of the power consumption of other technologies. Arrestingly, Kleer battery life is 10 times that of Bluetooth solutions. As a result, wireless audio products can utilize smaller batteries to achieve true compact form  without sacrificing sound quality. 3D Mass Design and Engineering prides themselves on being able to assist our clients through all the stages of product development, helping them transforming their concepts into fully functioning physical prototype models. We specialize in design and engineering, serving a diverse client base from the entertainment, medical and automotive industries.